John Tyndall was born on 2nd August 1820 at Leighlinbridge, County Carlow, Ireland, the son of a constable in the Royal Irish Constabulary. He attended the local National School and at the age of nineteen joined the Ordnance Survey of Ireland. Three years later, in 1842, he moved to the English Ordnance Survey in Lancashire where he worked until 1844 when he became a railway surveyor. In 1847 he was appointed to teach mathematics and surveying at Queenwood College, a school for boys in Hampshire. There he became friends with the chemistry teacher Edward Frankland (later Sir Edward Frankland an eminent Victorian chemist noted inter alia for his pioneering work in organometallic chemistry and valency theory). In 1848 Tyndall (with Edward Frankland) moved to the University of Marburg in Hesse where he spent two intensive years studying chemistry, physics, and mathematics for the degree of Doctor of Philosophy. His teachers included the organic chemist Robert Bunsen, but the title for his doctorate thesis was a mathematical subject. With Bunsen’s colleague, Karl Knoblauch, Tyndall began a series of studies on diamagnetism and the magneto-optical properties of crystals, phenomena that had been discovered by Michael Faraday in 1845. Tyndall continued this research when he went to Berlin in 1851 to work with Gustav Magnus. These studies did not immediately produce a job in science, in either Germany or England, and so at the end of his time in Berlin he returned to Queenwood College. However, he began to be known in the English scientific community and at the 1851 Ipswich meeting of the British Association Tyndall met Thomas Huxley who became a lifelong friend. Furthermore he attracted the patronage of Henry Bence Jones, the Secretary of the Royal Institution, and Edward Sabine, the Treasurer of the Royal Society. After applying, unsuccessfully, for positions in various colonial universities, Tyndall was invited to delivered a Friday Evening Discourse at the Royal Institution in February 1853 which was so successful that in May he was appointed Professor of Natural Philosophy there. He thus became a colleague of Faraday’s and, despite their differences in age and outlook, they became quite friendly, Tyndall looking up to him as a father figure – something that Faraday was slightly uncomfortable with. Following a Friday Evening Discourse on the cleavage of slate in 1856 in which Tyndall argued that the phenomenon was caused by pressure alone, Huxley suggested that the same explanation might also account for the laminated structure of glaciers. Both Tyndall and Huxley then visited the Alps to study glaciers – it was the start of Tyndall’s lifelong association with the Alps both as a subject of scientific study and as mountaineer. He was the first person to climb the Weisshorn in 1861 and seven years later became the first person to traverse the Matterhorn. Later he built a chalet at Belalp where he would spend much of the summers. During his first visit and thereafter annually, Tyndall, made many measurements on glaciers and concluded that the motion of glaciers was due to the regelation of ice under pressure – a phenomenon that Faraday had discovered in the early 1850s. While in the Alps, Tyndall observed the low temperatures in the mountains which he found strange because of the strength of the sun and the continuing existence of glaciers. This led him to research the part played by water vapour and other gases in absorbing and transmitting heat. Such studies had been undertaken previously for solids and liquids, but not for gases from which Tyndall concluded that the effect was probably small. During 1860 and 1861 Tyndall developed an experimental arrangement in the basement laboratory of the Royal Institution to measure heat transfer and absorption through gases. This involved the use of galvanometers and thermopiles to make measurements of heat passing through a long tube (Figure 1). He found that the main constituents of the atmosphere, nitrogen and oxygen, were almost entirely transparent to heat. However, and somewhat to his surprise, he observed that the smaller components of the atmosphere, for example carbon dioxide, water vapour or ozone absorbed more that 80% of the radiation passed through them. Tyndall explained this finding, as he sought to explain all natural phenomena, in terms of molecules. In this case compounds could vibrate in more ways than individual atoms. “This aqueous vapour is a blanket more necessary to the vegetable life of England than clothing is to man. Remove for a single summer-night the aqueous vapour from the air which overspreads this country, and you would assuredly destroy every plant capable of being destroyed by a freezing temperature. The warmth of our fields and gardens would pour itself unrequited into space, and the sun would rise upon an island held fast in the iron grip of frost." 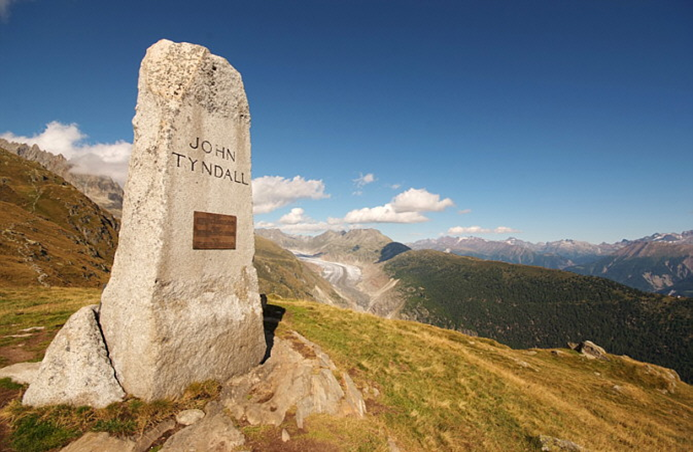 The memorial stone to John Tyndall at Belalp, Valais, Switzerland“ … the aqueous vapour of the atmosphere must act powerfully in intercepting terrestrial radiation; its changes in quantity would produce corresponding changes of climate. Subsequent researches must decide whether this vera causa is competent to account for the climatal changes which geologic researches reveal.” John Tyndall, Proceedings of the Royal Society of London, 1860-1862, 11, pp 100-104. Shorn of Tyndall’s insularity, this is a description of the ‘greenhouse effect’, which is now recognised as one of the major drivers of global climate change. Although Tyndall carried out the fundamental physics and chemistry in the Royal Institution’s laboratory, the initial idea for this research came from his time in the field, amongst the mountains and glaciers of the Alps. It is in the latter aspect that Tyndall’s contribution has been publicly recognised by the naming of mountains and glaciers after him around the world. These and other glaciers are now in retreat, and it is to be hoped that by continued understanding of the mechanisms involved, initiated by Tyndall’s research, and taking the appropriate social, economic and political actions, that the glaciers named after him will continue to exist long into the future. 1. A. S. Eve and C. H. Creasey, Life and Work of John Tyndall, Macmillan & Co., London, 1945. 2. N. D. McMillan, R. C. Mollan and W. H. Brock (editors), John Tyndall: Essays on a Natural Philosopher, Royal Dublin Society, Dublin, 1981. 3. J. R. Fleming, Historical Perspectives on Climate Change, Oxford University Press, New York, 1998. 4. W. H. Brock, ‘Tyndall, John (1820-1893)’, Oxford Dictionary of National Biography, Oxford University Press, Oxford, 2004. This article is based on a presentation by Professor James at the joint ECG/Historical Group Symposium ‘Environmental Chemistry: A Historical Perspective’ held at Burlington House on 26th October 2011.